After making the playoffs for the fifth straight season, seventh-seeded ARC volleyball team suffered an upset loss at the hands of 10th-seeded Feather River College on Tuesday in four sets, 25-12, 18-25, 25-21, 26-24. The Beavers entered the tournament after ending the regular season with six wins in a row, but were hard pressed to find any offense in the first set, as the visitors managed to open up a wide gap at 25-12. ARC did manage to pull out the second set at 25-18 despite Feather River’s 16 kills in the set, but the Eagles turned the game back in their favor in the third set winning 25-21. 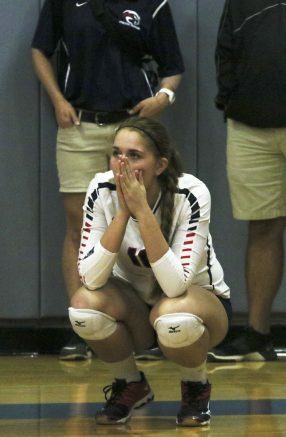 American River, facing elimination from the tournament, made the fourth set a back and forth one, with both teams seeking the advantage that would allow them to prevail. While the game went down to the the final couple of points, the Beavers were unable to fend off the attack of the Eagles and suffered their earliest exit from the tournament since 2012. Coach Carson Lowden commented on the ability of the Feather River team to inspire their players and keep the momentum gathered in the first set. Sophomore Kaitlyn Meyer talked about the season and how they fought until the end. “We had a lot of ups and downs, we ended on a high note, and we definitely peeked at the end of the season and that’s great,” Meyer said. Emily Dzubak said that the team played well this season and was happy of how well the team bonded over the season. Lowden said that overall, the season was a success. The Beavers end the season with an 18-9 record on the season, including going 12-4 in Big 8 conference play. Be the first to comment on "Volleyball season ends with playoff loss to Feather River"